Lucky me! Browsing at a Charity shop I found an armful of the garden magazines called BBC Gardens Illustrated for ten cents each. What a wonderful bargain! This magazine is a gorgeous mix of beauty and information. My experience of 'highly respected international gardening magazines' is rather patchy. 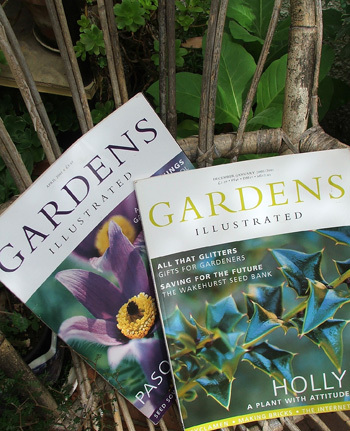 And, apart from my favourite Fine Gardening I read magazines more for a mid-winter escape than for the information (and inspiration) they may or may not contain. I'm a colonial gardener, and New Zealand is a land of the DIY tradition (Do It Yourself). Few of the gardeners that I know bother to source fabulous traditional garden furniture and amazing replica Victorian glasshouses. So it's confession time - the thing I like best of all about Gardens Illustrated are the advertisements. Oops! English lead statuary, terracotta from Tuscany, glasshouses endorsed by the Royal Botanic Gardens, Kew, and one hundred percent recycled trugs as used by top TV gardeners... Wow! These garden accessories are a million miles distant from my bendy chicken wire compost 'bin' and my retro concrete garden gnomes. These advertisements have real style and class! But I do enjoy the articles, and obviously I love looking at the pictures. And since I read BBC Gardens Illustrated from cover to cover, it's a great for a long, thoughtful reading session.